In a recent case filed in California Superior Court, plaintiff Edward Davis sued Bag’N Baggage, a Colorado-based luggage company that owns retail stores in California, claiming violations of the Americans with Disabilities Act (ADA) and California’s Unruh Civil Rights Act in connection with the defendant’s website, ColoradoBaggage.com. Davis, who is permanently blind, used a screen reader to access the Internet and read website content. In the Complaint, he alleged that Bag’N Baggage’s website presented several barriers to use for the visually impaired, including linked images missing alt text, empty links, and missing form labels, which prevented visually impaired customers from shopping for the defendant’s products online. The plaintiff further claimed that the defendant’s retail stores are “public accommodations” as that term is defined in Title III of the ADA, and the barriers to the visually impaired in the Bag’N Baggage website constituted intentional discrimination in violation of the ADA and the Unruh Civil Rights Act, Davis told the court. The plaintiff moved for summary judgment and Judge Bryan F. Foster granted the motion. In addition, the plaintiff was entitled to damages under the Unruh Act of $4,000 because the “undisputed evidence is that Plaintiff’s access to the website was prevented by the Defendant at the time the website was designed,” the court said. “Repeated attempts at access to the website known by the Plaintiff to be unavailable to him does not constitute additional offenses” requiring additional damages, however. 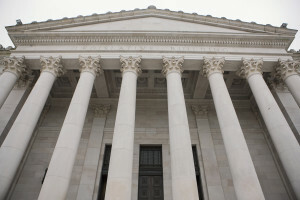 Many courts across the country have ruled that retail websites with a sufficient nexus to a brick and mortar location are covered by Title III of the ADA and therefore must be accessible to the visually impaired. At this point, however, the law is unclear on whether an Internet-based business with no brick-and-mortar locations is covered by the statute and can be liable for discrimination. However, as detailed in a previous post, the Department of Justice has taken the position that Internet-only sellers fall under the purview of the ADA, will soon issue regulations governing compliance.